The Esri Startup Program gives emerging businesses an edge by helping them integrate spatial functionality into their products and services. Program participants receive ArcGIS platform technology, training, support, and marketing opportunities to help them succeed. Some startup developers are using the Esri Startup Program to build solutions that combine ArcGIS with innovative hardware. Smart glasses, spherical monitors, and drones can help companies better understand their work and natural environments. Using these devices helps organizations gather, visualize, and analyze data, bringing the purpose of GIS—to deliver actionable information—into the forefront. Learn more about the Esri Startup Program. 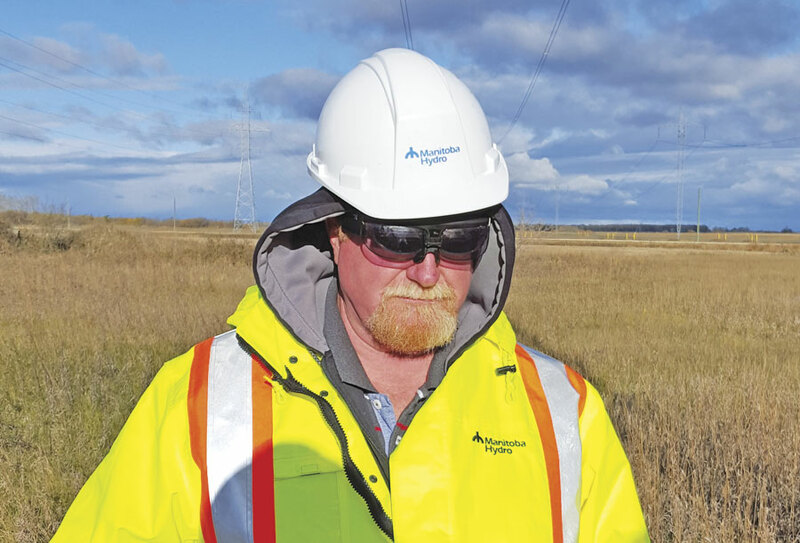 A fieldworker for Manitoba Hydro, a major energy utility in Manitoba, Canada, uses VisualSpection augmented reality smart glasses to record GIS information about a power line corridor. Wearable GIS technology gives frontline workers a new perspective on facilities maintenance. Equipping wearers with a second set of eyes, VisualSpection’s augmented reality smart glasses include a touchpad, camera, and visual overlay (which displays images on top of video). Wearing the glasses, fieldworkers drill, dig, scale towers, and go down sewers while accessing and collecting data. At the same time, asset managers get a first-person perspective on facilities through the eyes of field crews. A utility worker wearing the glasses could walk up to a power pole and see its transformer information in the visor. The glasses record the worker’s comments, take photos, and capture location information. They are voice driven, so the worker can safely maintain three points of contact with the pole. The smart glasses allow georeferenced data to flow from the worker to the office in near real time. An audio application transcribes any recorded comments into digital field notes. To make the information easily accessible, VisualSpection automatically transfers the field data to ArcGIS Online and ArcGIS for Server. 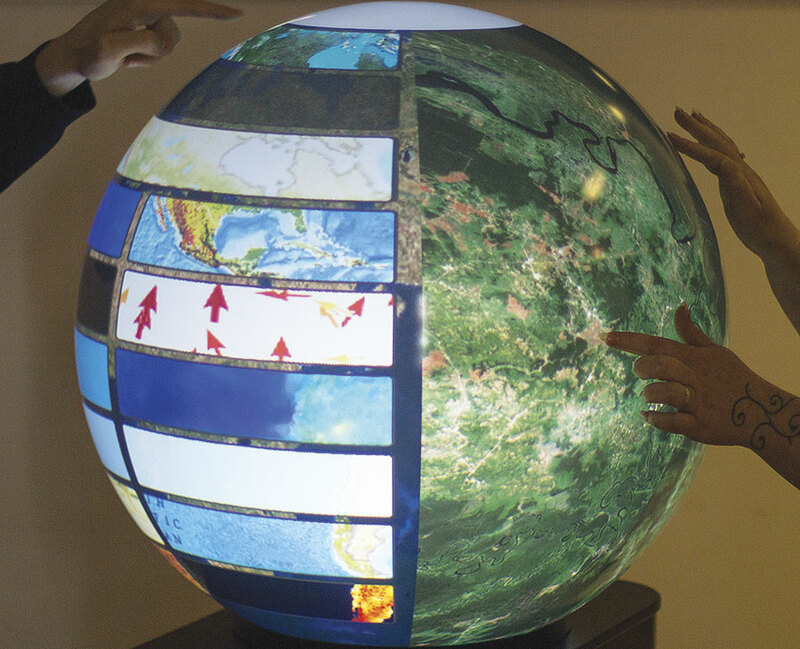 A pair of analysts works with ArcGIS on the PufferSphere globe to collaborate on two aspects of the same project. They use gestures to access data and tools. Pufferfish designed PufferSphere, a spherical projection display, for visualizing many types of information, including map projections. By integrating its sphere solution with ArcGIS, Pufferfish has opened exciting prospects for users to showcase global GIS data in an intuitive globe format. The globes are popular with museum visitor centers. Visitors interact with the spherical data to understand the surface of Mars or Earth’s tectonic plates. Users access global data from NASA, for example, to understand ecology and climate change stories in a visually appealing way. The sphere also projects videos. Working with Esri, the startup’s designers have equipped the sphere technology with ArcGIS workflows. Users publish their maps to the globe and seamlessly interact with data layers and features. They can drill into information, add map layers to a basemap, and interrogate data. PufferSphere allows many people to work with the sphere at once. The globe image divides into three independently controlled segments, each with identical functionality. Pufferfish and Esri continue to add more GIS capabilities to the sphere, such as real-time data visualization. The sphere has potential for corporate applications, too, such as visualizing global assets, wind layers, and shipping routes. Its natural shape makes for intriguing geographic storytelling. 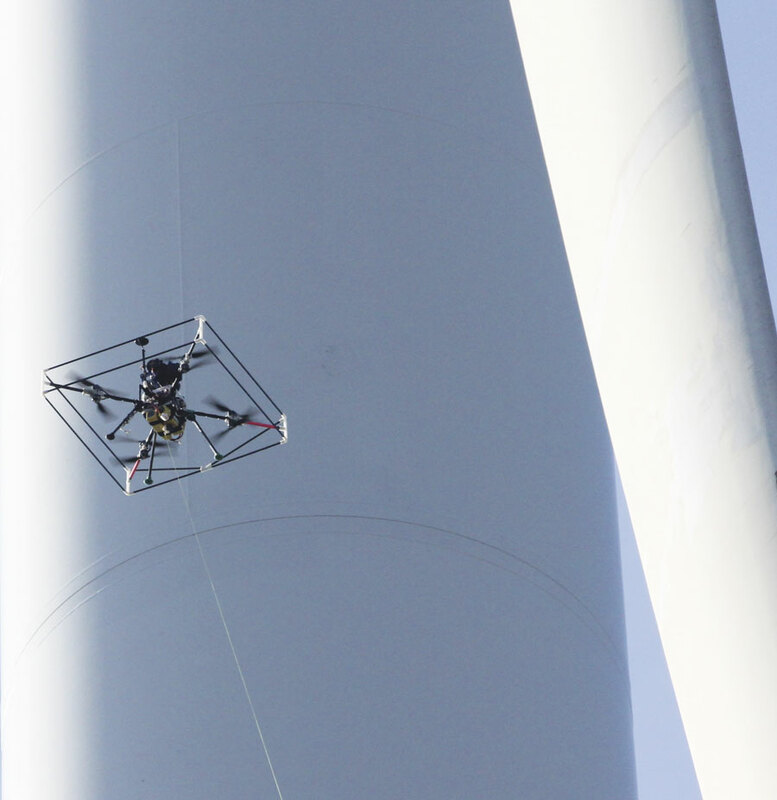 A quadcopter captures images of a wind turbine blade that are then added to an asset management map. InspecTools has created an asset inspection solution that uses drones and other methods to mitigate power generation and transmission problems. Utility companies use it to keep wind turbines, transmission and distribution lines, and more, in working order. The inspection tool solution employs ArcGIS to process sensor data collected by aircraft, unmanned aircraft systems, infrared aerial inspection devices, and other sensors. It generates intelligent map products that help managers understand the conditions of their assets so they can take action. 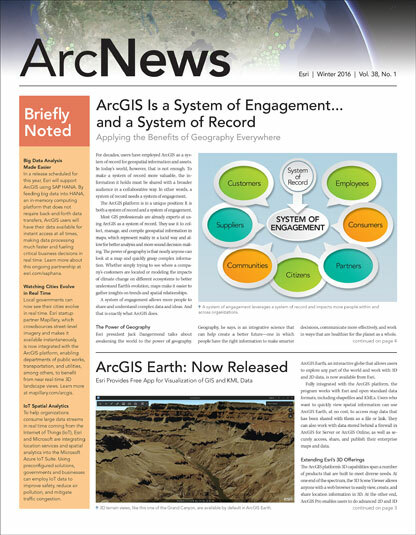 ArcGIS serves as a system of record for the entire life history of each asset. To mitigate wear on wind turbine blades, InspecTools uses image sensors and custom-made drones that can withstand high winds to take very-high-resolution images of the blades. The data goes into a geodatabase along with the turbine’s factory blade information, status, and maintenance history. Users can open a schematic of the wind farm, click a tower, check blade wear, and draw a polygon around the problem right on the photo. Utilities in the United States and Europe use manned and unmanned aircraft (respectively) to fly along power line corridors and locate vegetation that endangers the network. Comparing tree encroachment to tree heights, users can figure out where vegetation needs tending. Users can also lay lidar-generated digital elevation models on the photos to locate vegetation risks more accurately. As the Federal Aviation Administration incrementally introduces drone regulations in the United States, more room will open up for the use of drones in industry. When it does, GIS solutions will already be in place.